Home / For Homeowners / Time to replace your skylights? Are They Leaking, Hail Damaged, Have Cloudy Glass, or You’re Just Not Sure How Much Longer They’ll Last? Energy Efficient Replacement Skylights, No Matter the Size or Style. 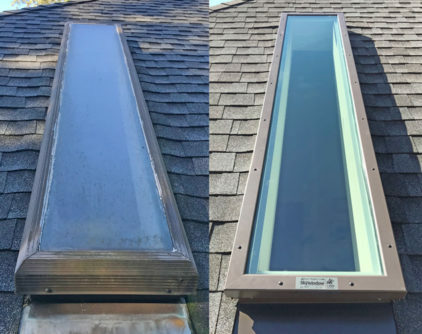 Replacement of a 17″ x 96″ discontinued skylight brand with a custom size Wasco SkyMax skylight in Green Brook, NJ. Wasco skylights are easy to install, come in standard and custom sizes, and are available with many paint color options or copper cladding. Replacing skylights is easier – and less expensive – than you might think. Wasco offers a wide range of standard sizes that will easily replace any old skylight, whatever the brand. If your skylight seems to be an odd size, don’t worry – Wasco can build a custom skylight, even up to 32 square feet in size. That means no re-framing of the opening, and little or no painting or trim work will be needed, saving time and money. Replacing your skylights when you re-roof is cost-effective and it allows you to synchronize your roof and skylight warranties. Today’s models are also more energy efficient, saving on heating and cooling costs. Our network of certified installers are expert roofing contractors and home remodelers, and will be able to manage the project from start to finish. You Can Easily Do It Yourself. 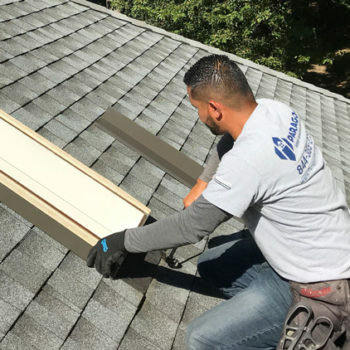 If you plan on replacing the skylight yourself, Wasco is the best choice by far. Our E-Class Skywindow skylight is ready to go, right out of the box. 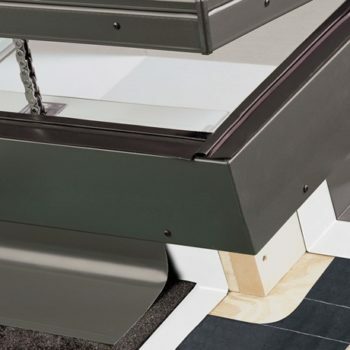 The unique and patented one-piece design, featuring the impenetrable Ultraseal® water barrier, requires no step flashing, mastic, or sealants, installing in 1/3 the time of other models. Brackets and screws are the only hardware. Simply place the skylight over the opening, fasten to the roof, and shingle around it. Upgrade to a Wireless Motorized Venting Skylight for Free! Solar powered venting skylight is remote operated, battery powered, and solar charged. 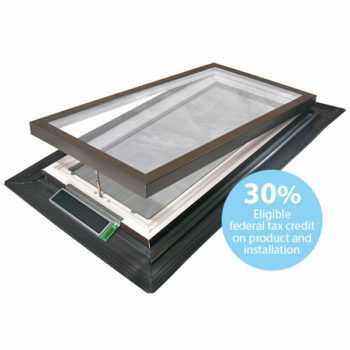 30% Federal Tax Credit on both the purchase and installation! *Based on the estimated costs for skylight and a typical installation. Consult a contractor for actual costs. What Kind of Skylight Do You Need? Deck mount skylights are fastened directly to the roof deck, and are ideal for thinner roofing materials such as asphalt shingles. Self-flashed skylights do not require a flashing kit – the flashing is part of the one-piece skylight. They are suitable for roofs with no less than 3″ in 12″ pitch. Curb mount skylights are mounted on a 2×4 wooden frame (a curb), and are ideal for thicker roofing materials such as tile or metal. Curb mount skylights require either a flashing kit, or a custom site-built flashing system around the wooden curb. They are suitable for flat or pitched roofs. Deck-mount skylights are fastened directly to the roof deck. 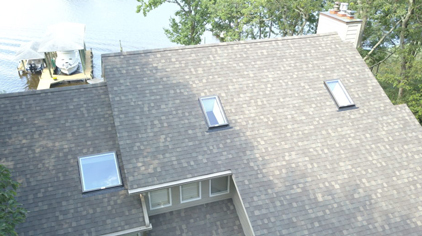 For use with shingles up to ¾” thick – asphalt, slate, or shake – on roofs with more than 3″ in 12″ pitch. Wasco’s energy efficient E–Class self-flashing Skywindow® skylights fasten directly to the roof deck. The inside of the skylight frame aligns with the roof opening, instead of inside it, allowing a much larger glass area compared to competitors. Because of its unique and patented design, Wasco’s E-Class™ venting skylights allow up to 46% more daylight*, and circulate more fresh air throughout your home. *Up to 46% more daylight compared to leading competitor, up to 22% more daylight with fixed models. Curb-mount skylights are mounted on top of a wooden frame. For use with tile, metal, or wood and shake shingles thicker than ¾” on flat or pitched roofs. Skylights consist of an insulated glass sealed between a thermally efficient, maintenance free, curb frame and an aluminum outer retainer frame. 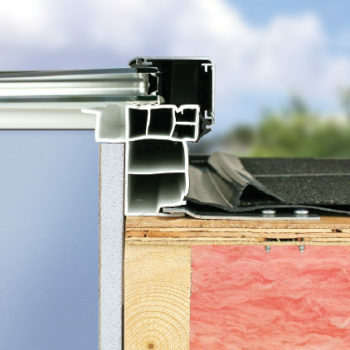 Flashing is installed around a site-built curb, then the skylight is mounted onto the curb. Factory pre-finished white frames and sashes provide a high quality finish, eliminating the need to paint. For large sizes, consider Wasco’s SkyMax™ curb mount skylight, available in custom sizes up to 32 square feet! Wasco’s award-winning Architectural Series offers lightweight framed residential skylight systems that give you a custom look at an affordable cost. 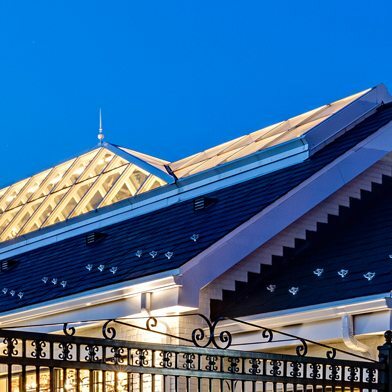 Choose from our versatile Pyramid Systems in Square, Octagonal and Extended configurations, or our dramatic Low Profile for pitched roof applications, all with a full range of glazing options including our hurricane resistant glass.